A first round exit one year ago, the host nation’s Azeez Olugbenga Jamiu closely followed by Romania’s Rares Sipos emerged the player to cause the biggest upset in the second round of the Men’s Singles event at the 2018 ITTF Challenge Seamaster Nigeria Open in Lagos on Friday 10th August. Both caused the downfall of highly seeded adversaries. 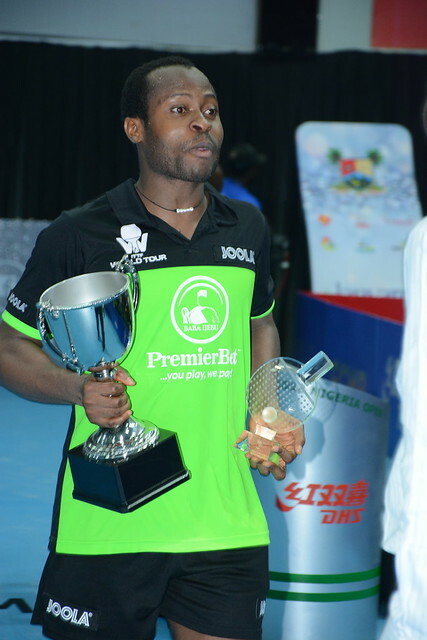 Currently listed at no.518 on the current Men’s World Rankings, Azeez Olugbenga Jamiu beat Brazil’s Thiago Monteiro, named at no.108, the no.4 seed in Lagos and winner on the 2015 ITTF World Tour in Chile. Impressively, he emerged successful in six games (11-9, 11-3, 5-11, 11-3, 3-11, 11-8). Meanwhile, for Rares Sipos, it was somewhat a reversal of fortunes. Earlier in the day, the top seed in the Under 21 Men’s Singles event, he had suffered defeat at the quarter-final stage by the narrowest of margins when facing China’s Wang Shaobo (10-12, 11-9, 11-8, 6-11, 11-9). In the second round of the Men’s Singles competition, it was success by the very narrowest of decisions; the no.29 seed, he overcame England’s Sam Walker, the no.5 seed (11-6, 7-11, 4-11, 11-6, 12-10, 7-11, 11-9). Two upsets and there were five more as the second round of the Men’s Singles event progressed. Moreover, there was further success for Nigeria. Makanjuola Kazeem, the no.32 seed, beat Congo Brazzaville’s Saheed Idowu, the no.13 seed (11-3, 9-11, 11-9, 4-11, 11-9, 11-9); thus increasing the number of host nation players in round three to four in number. In addition as anticipated, Quadri Aruna, the top seed, beat Egypt’s Khalid Assar, the no.30 seed (11-7, 11-9, 10-12, 11-4, 17-15); Segun Toriola, the no.14 seed, overcame South Africa’s Kurt Lingeveldt, the no.28 seed (11-7, 16-14, 11-4, 11-9). Success for Nigeria contrary to expectation, in a similar vein there was also success for India. Raj Mondal, the no.31 seed beat Frenchman Alexandre Robinot, the no.6 seed (11-8, 12-10, 7-11, 11-7, 10-12, 7-11, 11-9); Ronit Bhanja, who had been required to compete in the two day qualification tournament, ousted Laurens Tromer of the Netherlands, the no.12 seed (10-12, 11-9, 10-12, 11-3, 12-10, 11-4). However, for one Indian player of note there was defeat; Sarthak Gandhi, last year’s runner up, was beaten by Russia’s Alexey Liventsov, the no.2 seed (7-11, 11-3, 11-8, 11-9, 11-8). Five surprises, the two remaining upsets were caused by Frenchman Joe Seyfried and by Thailand’s Padasak Tanviriyavechakul. Joe Seyfried, the no.19 seed, beat Luxembourg’s Eric Glod, the no.15 seed (11-8, 3-11, 11-6, 11-8, 9-11, 11-3, 11-8); Padasak Tanviriyavechakul, the no.17 seed, overcame Hungary’s Tamas Lakatos, the no.8 seed (11-6, 7-11, 9-11, 11-9, 14-12, 11-6). Upsets abundant and there was almost one more amongst the leading names, Finland’s Benedek Olah, the no.3 seed and winner in 2016 was stretched to the very limit by Iran’s Miad Lotfijanabadi; he emerged successful but only just (11-8, 8-11, 9-11, 11-8, 4-11, 11-8, 11-9). The third round and quarter-finals of the Men’s Singles event will be played on Saturday 11th August.